Working as a TV news producer can be a highly demanding, yet very rewarding career. Working in this job typically means you're given the task of managing a daily newscast from start to finish. Before airtime, that means overseeing all the news stories for accuracy, fairness, and grammar. During the newscast, being a news producer requires timing stories, weather, and sports to make sure the newscast ends on time and leading the production department crew in the control room to make sure the newscast is executed cleanly on the air. A TV news producer usually spends the entire workday inside the station, unlike a TV news reporter who will be out gathering stories all day. While TV news producers must work closely with the news anchors, it is vital to have a good working relationship with just about everyone else in the building. Considering the stress of being responsible for an entire newscast, the salary for a TV news producer starts incredibly low. Expect somewhere between $20,000 to $25,000 as base pay at most stations in a smaller DMA. The payoff is that good producers are always in demand, even in a bad economy. You can find yourself either moving up to a larger TV market quickly or shifting into more managerial roles (such as an executive producer or assistant news director). Because a TV news producer is off camera, that person isn't judged based on physical appearance. A producer will never earn as much as a top anchor at any TV station, but a producer is often brought in for planning discussions, focus groups and other closed-door meetings that anchors aren't invited to attend. A producer needs to have a college degree in communications, journalism or English. A background in business or political science can help a TV news producer appear more specialized when looking for work. 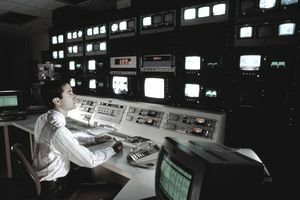 With the enormous responsibility of managing a newscast, a command of media law, simple grammar and TV production techniques is also critical. A producer is often the person having to explain to the boss when a newscast is full of technical or editorial mistakes, so quality control is also important. A TV news producer has to be calm in a crisis, whether that's during breaking news coverage or when some piece of technical equipment breaks. The best TV news producers give their anchors confidence that everything is going well, even if the control room happens to be on fire. A TV news producer will be instructed on the branding goals at the TV station. This may come from the news director or from the station's news consultant. The producer will be expected to understand these brand-building directives and make sure that every newscast follows the template. That can be as simple as knowing the 5 p.m. newscast should be crafted to appeal to women in the 25-54 age demographic or being told that the newscast must contain three live shots every day. A 6 p.m. newscast producer may arrive at the station at 9 a.m., but her entire focus will be on spending all those hours getting ready for airtime. The producer will make regular contact with reporters throughout the day in determining which one's story deserves to be the lead story in the newscast. When the evening anchors arrive in the afternoon, the producer is often the person who briefs them on the day's news and goes over the plans for the newscast. In the case of breaking news, a producer must be ready to respond, even if that means scrapping all the plans made for the newscast and starting over late in the day. Producers generate plenty of scripts, so they must love to write. They also decide which graphics to use on the newscast and when maps are needed on the air. Many help make decisions on which reporters will be live in the field. A station's producers also have to work with each other to ensure there's continuity between newscasts. A 6 p.m. producer will get the late news producer up to speed when that person gets to work. If there's a problem, like a misspelling on a graphic, a producer will alert the next producer so that the same error doesn't get back on the air. Sometimes, TV news producers are overlooked when it comes time to praise the news team for an outstanding newscast. The anchors may have read their scripts flawlessly and the reporters may have delivered compelling reports. But it takes a producer to turn all of the day's puzzle pieces into a cohesive TV program. TV news producing isn't grunt work. Nor is it a job for people who want to stay by themselves in a cubicle all day. It takes a great deal of leadership ability and team-building skills. Add to that a massive attention to detail so that everything comes together at air time. Good broadcast writing skills are important, but many excellent news writers don't succeed as a TV news producer because the job requires so many additional abilities. An aspiring producer should look for a mentor to get tips on being creative while under tremendous deadline pressure. Because TV is a visual medium, the best producers think in pictures and are always asking themselves how something will look on the screen. So, good video shooting and editing skills can help a producer mentally put a newscast together. It's no wonder why so many TV news executives got their start as newsroom producers. If they can create daily half-hour newscasts, it's actually less stressful to run the entire news department.